A couple of photos of the current snow fall here in the Yorkshire Dales. We have had a couple of inches on the ground for a few days now and nicely topped up last night with another 2 or 3 inches. Not sure the Hens were too impressed. 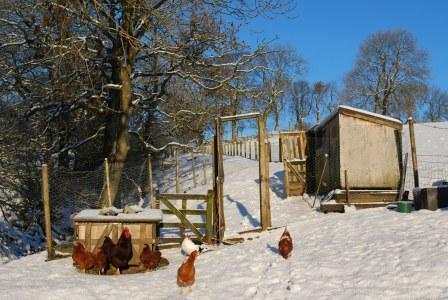 Also as hen production has gone down, hen consumption has gone up, lessened the numbers by 11 and still getting the same number of Eggs! so at least we know we despatched the correct one’s! So this week have made Coq au vin with a couple of the old hens! should that be Hen Au Vin! and chicken veg soup, chicken stock and some very very sticky (slightly over cooked) pork spare ribs. Coq au vin all gone! Well done sticky pork ribs! 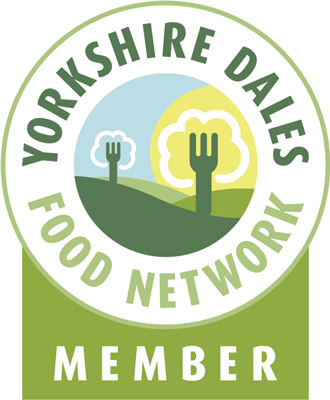 This entry was posted in Yorkshire Dales Food and tagged coq, dales, hen, hut, office, photo, pork, ribs, snow, spare, sticky, vin, window, Yorkshire. Bookmark the permalink. Chris, Look at the plate behind… she left a little bit of chicken on the bone…. that’s not like her, clearly too keen to have a picture taken! Didnt know you had all the snow.. been waiting down south for some all week.